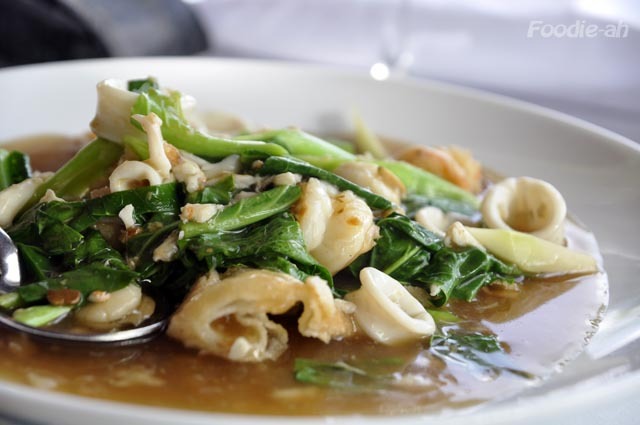 Baan Rim Pa is without a doubt the most well known upmarket restaurant on the island, enjoying a stable customer influx. The restaurant is constantly fully booked during mid/peak season, but it's easier to get a table without a reservation during low season. I managed to get a wonderful table with a view on a walk-in, but at this time of the year Phuket is extremely quiet. The sea view from the balcony is one of the best in Phuket, and the restaurant is also well known for its fine wines selection. The question is whether the food is really worth the extra cost, or is it all spent just on the dining experience? I ordered a pomelo salad ($315 THB), which was served within a beautifully carved pomelo. This was by far the best Thai salad I ever had. The pomelo itself isn't too sweet nor sour, allowing the other flavours to emerge. The seasoning is typical of thai salads, a combination of fish sauce, sugar, lime juice and chilli, but it was rounded by a hint of coconut milk. 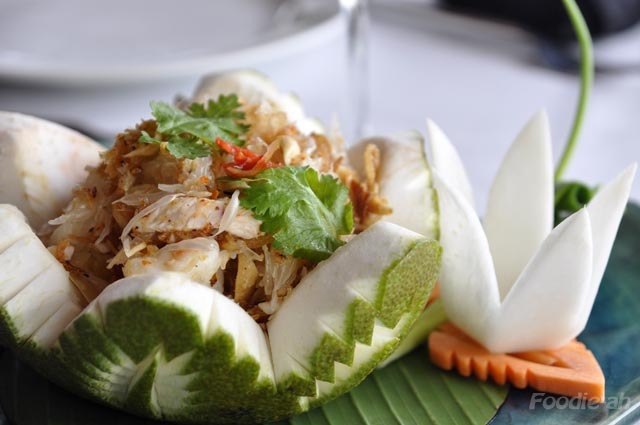 The mix of textures was great, dominated by the firmness of the pomelo, juicy prawns and crispy fried shallots. Baan Rim Pa have their own collection of pretty porcelains. 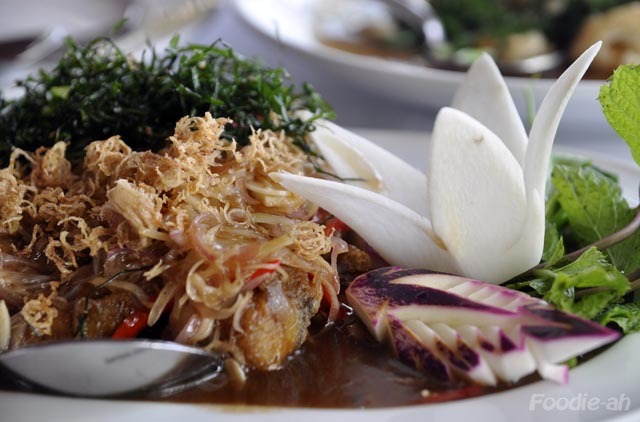 The deep friend fish with lemongrass (645 THB) is a typical dish from Phuket. I tried it elsewhere in the best 'traditional' restaurant of the island, and I can say with confidence that Baan Rim Pa's version is far superior. They achieved such a superb balance of flavours and textures that keeps you asking for more. Thai food is not my favourite, but I would have this dish again and again. If you like lemongrass, this is a must-try. The fried noodles with creamy sauce and seafood ($265 THB) intrigued me due to the 'creamy sauce' description. In reality, what they defined a 'creamy sauce' was just your normal starchy noodle sauce. Despite that, these noodles were very unique. Imagine lumps of horfun noodles cooked, chopped into chunks while still partially glued together and then pan fried to the point of getting crispy, then topped by a starchy stock-based sauce and mixed seafood. The condiment was good, although nothing you wouldn't get elsewhere in Singapore, but the texture of the noodles was truly unique. 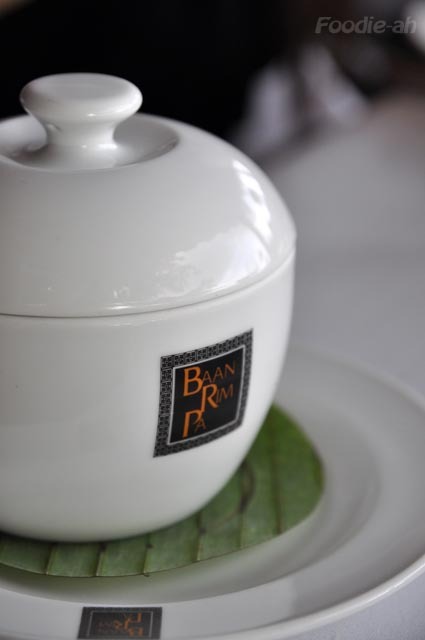 If you are looking for fine Thai cuisine, then Baan Rim Pa is worth paying for, since the food is definitely a level above what you find elsewhere on the streets of Phuket. Prices can be steep for Thai standards, but not prohibitive when compared to Singapore. This meal cost 1,865 THB for two people (approximately $80).